As all over the Basque Country, where there is a special liking for culinay pleasures, gastronomy in Debabarrena is an absolute must. 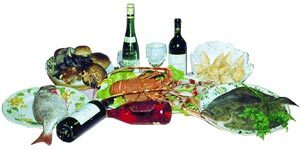 Its varied offer allows you to taste the best dishes from Basque cuisine at more than reasonable prices. Eating in the restaurants, grill houses, cider houses or simply devouring some pintxos, small snacks are options that undoubtedly will not even disappoint the most demanding diner. the freshest products from our fields and sea form the authentic base of this gastronomy; the perfect excuse for a break on the road.